Silvio Cella, with son Michael (in headphones) on the sidelines, was a three-sport athlete at Revere High School himself. Beginning in 1950, he enjoyed a 49-year career as teacher, coach, and administrator at the school. Two months ago, former Revere High football coach and athletic director Silvio A. Cella received a letter and package from one of his former players, Jim Love. Enclosed was the game ball that Love was given after the team’s 13-0 Thanksgiving Day victory over Winthrop in 1973 that concluded a 9-0 regular season and qualified the Greater Boston League champions for the second annual Super Bowl championship game. Mr. Cella, whose career as a teacher, coach, and administrator at Revere High spanned 49 years, died of cancer April 14 at the Lynnfield home of his daughter Gina. He was 87 and a lifelong Revere resident. “The impact our dad has had on our family and on his players, colleagues, and friends is remarkable, and we couldn’t be prouder of him and his legacy,’’ his daughter said. Mr. Cella was a 1942 Revere High graduate and three-sport star. He returned to his alma mater in 1950 as a mathematics teacher and retired as athletic director in 1999, a position he held for 40 years. He was head coach at Revere from 1950-54, an assistant at Somerville from 1955-57, and head coach again at Revere from 1963-83. His accolades included selection as Massachusetts Athletic Director of the Year in 1987 and induction to the Massachusetts High School Football Coaches Hall of Fame in 1990. 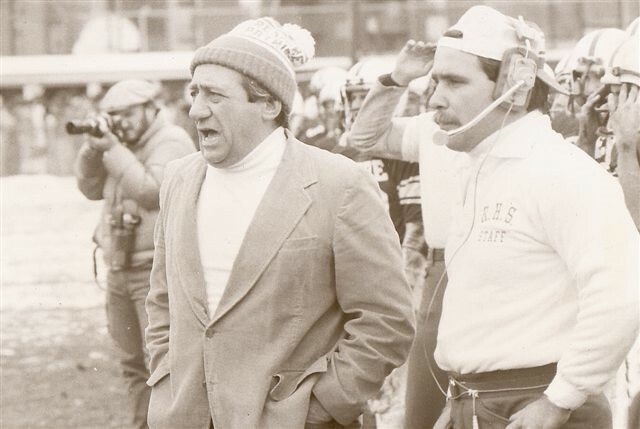 A former United Press International All-America fullback/linebacker at Boston University, Mr. Cella coached Revere to five league championships and 125 victories. Bob DeFelice, a former head football coach at Winthrop High who is now baseball coach and athletic director at Bentley University, did his student teaching at Revere High in 1963 while attending Boston College, four years after Mr. Cella became athletic director. Former star quarterback Jim Del Gaizo, who went on to an NFL career that included playing for the undefeated champion 1972 Miami Dolphins, said Mr. Cella developed a three-wide receiver offense, a strategy that professional teams didn’t employ until many years later. Mr. Cella served with the Marines during World War II and was assigned to the battleship USS Wisconsin, where he was an aide to Admiral William F. “Bull’’ Halsey. After his discharge, Mr. Cella reenrolled at BU, where he was a starter (1947-48) on winning teams coached by his mentor, Aldo “Buff’’ Donelli, who was so impressed with Mr. Cella that he appointed him an assistant/freshman coach for the 1949 season after Mr. Cella’s graduation from the School of Education. According to Billy Tighe, who was BU’s starting quarterback alongside Mr. Cella, the latter’s talents were not restricted to the gridiron. After dinner in the field house at the football team’s training facility in Auburndale, Tighe, who will start his 35th season as head football coach at Lexington High this fall and 60th season of coaching overall, would take out his banjo. Another teammate, Evie Dorr, played the bass fiddle and Mr. Cella was the lead singer of the trio they called the “Terrier-teers,’’ who would entertain the team and coaching staff before it was time to hit the books. Mr. Cella and his wife, Mary, who was called “Mrs. Coach,’’ by the Revere players, were high school sweethearts. They were married in 1949. Mary Cella died in 1994. Besides his daughter and his son, who is now an assistant football coach at Winchester High, Mr. Cella also leaves two grandchildren and two great-grandchildren. A funeral Mass for Mr. Cella will be said at 11 a.m. today in St. Anthony’s Church in Revere. Burial will be in Holy Cross Cemetery in Malden. Silvio Cella, who died April 14, is remembered as a no-nonsense coach and a compassionate friend. There were two sides to Silvio Cella, the longtime Revere High football coach who died April 14 at 87 after a courageous battle against cancer. There was Silvio Cella, the rough and tough, no-nonsense coach who prowled the Revere sidelines for a quarter of a century. He was a screamer and his booming voice could be heard above the roar of the crowd. Then there was Silvio Cella, the soft-as-a-teddy-bear, loyal, compassionate, quiet man. Over the years, though, Love discovered the soft side of Cella. He saw it when Cella coached his two sons — Jim and Tom — and steered them both to Brown University. And he saw it in tragedy — first when Cella lost his teenage son, Steven, in a canoeing accident in 1969, and again almost 40 years later in 2005, when Love lost his daughter, Patricia, to cancer at 46. “Underneath all that toughness was a great heart,’’ said the 77-year-old Love, who lives in Merrimac. “When he lost his son, he was strong, yet in deep pain. We were there for him, and tried our best to comfort and console him. Then when we lost our daughter, he was there for us. He told us to `hang in, that time would heal.’ He could relate to the pain we were suffering. He was compassionate and supportive and got us through the tough times. That brought us closer together. One of Cella’s proudest moments was when he and his son, Michael, who assisted his father at Revere and eventually served as head coach, coached the North squad in the annual Agganis All-Star Classic. Michael, now an assistant at Winchester, will coach this year’s game in June. Michael Cella would be the first to tell you that his father wasn’t afraid to scream or get in your face. He knows, because he also played for his dad at Revere. But he too saw the compassion and the soft side. Both will be sorely missed. The Cella family has established The Silvio Cella Family Foundation to support Massachusetts high school football programs. Donations may be sent to P.O. Box 1074, Lynnfield, MA 01940.